The perfect gift to celebrate the arrival of a new bambino! This gift includes items for the new baby together with a bottle of Prosecco for the new parents to toast the good health of the new arrival! Plasmon Baby Biscuits with milk protein 350g Italian baby biscuits made from top quality ingredients and fortified with vitamins and proteins. They are highly digestible and nutritionally well balanced. Suitable from 6 months old. 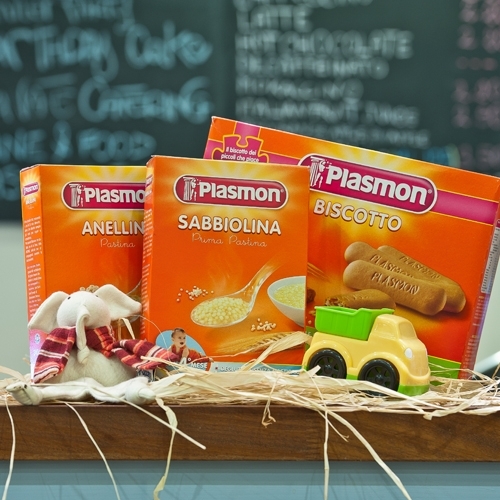 Plasmon Pastina 340g Italian baby pasta made with tender grain to make it more digestible. Enriched with vitamins, calcium and iron. Easy to cook and suitable for babies aged from 6 months.